Biocat has opened a new call for participants in The Investment Readiness Series, an initiative of Biocat that aims to increase the number of investment-ready research projects in the BioRegion of Catalonia. The program offers individual mentoring for research projects and connects them with investors for guidance and/or funding. This new call, open through January 3, is geared towards companies and projects that intend to set up a company within a year, approximately, in the medtech, diagnostics or digital health sector with their own innovative technology. The program is free and more than one project can be submitted per institution or head researcher. The projects submitted to the call will be sent to a group of venture capitalists, venture builders and corporate investors collaborating as Biocat’s partners in this program. The selected projects will get individual guidance and on 4, 5 and 7 March, the finalists will participate in two days of meetings with roughly twenty investors, during which they will be able to present their project, get feedback and begin contact for possible investments. In this case, the event will take place at TecnoCampus Mataró-Maresme. The first edition of The Investment Readiness Series, focusing on therapies, was held on November 6 and 8 at the Payment Innovation Hub featuring several biotechnology projects. Biocat and ACCIÓ are also organizing The Investment Readiness Series in the City, that will put entrepreneurs from the healthcare and life sciences sector in contact with investors from Britain's Golden Triangle, on December 12. Biocat expects to hold two calls for The Investment Readiness Series every year, each with a different theme. The program has the collaboration from TecnoCampus Mataró and ACCIÓ. 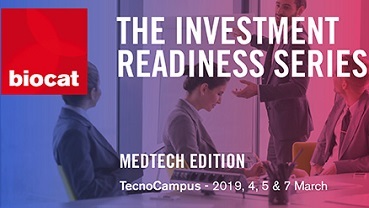 Proposals for the new call of The Investment Readiness Series - Medtech Edition can be submitted online through January 3.